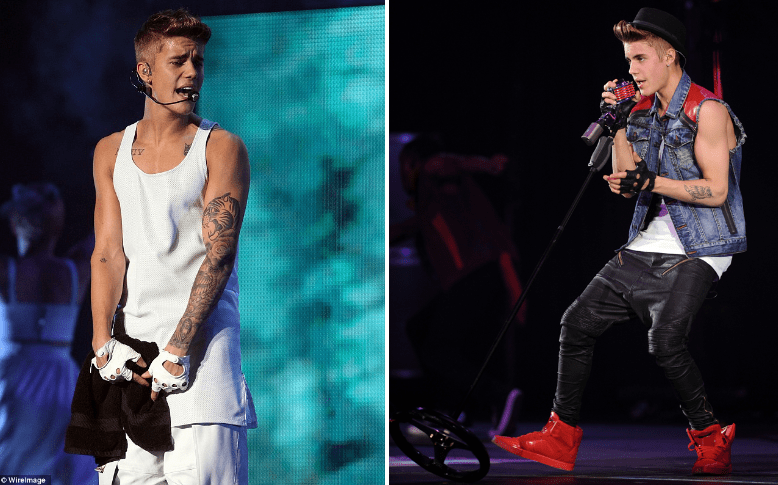 Justin Bieber’s style over the years has been a popular topic of discussion. From 2009 to 2018, we’ve seen the pop sensation try out every possible style out there. The changes in his style have been drastic and so we’ve decided to take a look back at how Justin’s style has evolved over the years from a kid in hoodies and high tops to a polished young man. One Time and My World – Upon skyrocketing to fame with the release of his debut single and EP, Bieber has a clearly preferred uniform. A purple top, grey pants, and high-tops. And of course, his signature swoopy hair. Although, special occasions called for a slight deviation. Appearances at the Grammys and the VMAs have JB sticking to sneakers, but some shiny pants and velvet shoes paired with a vest and tie were a little bit more fashion forward for the young pop star. A cool bomber jacket with the sleeves rolled up was a definite departure from his signature hoodie. My World 2.0 – With the release of Justin Bieber’s first debut album, we continue to see a combination of classics mixed with some new pieces. Keeping with his signature high-top sneakers and a splash of purple, we see another bomber jacket in Paris and then in Madrid later in the year, a grey asymmetrical leather jacket, this time paired with slightly more form fitting black jeans and the ubiquitous Supra Skytops in a metallic silver. Heading out on his first world tour in support of My World in 2011, Justin’s stage outfits consisted of white, silver, and purple in various combinations. We see a turning point in the pop star’s style here in 2012 with the release of “Boyfriend”. Starting with his hair, Justin left the soft and swoopy style behind for a more mature quiff. Fear not – the faithful high tops have not left us. The most notable fashion choices of 2012 involve what appear to be these hybrid jackets. From airports to awards shows, we see a bomber/motorcycle hybrid, a leather jacket/jean vest hybrid, and then finally at the 2012 BBMAs we have a triple threat: Leather jacket/jean vest/hoodie combination – cleverly accessorized with a chain. The end of 2012 also brought us the Believe tour, featuring this: A Leather Onesie. 2013 brought us a number of iconic style choices. Hair is got higher. The Supra Skytops make another appearance, in red this time. We also started seeing fashion forward accessories like these fingerless gloves and a hat that isn’t a baseball cap. 2013 is also notable because it’s the year we see Justin’s arm start to fill up with tattoos. Justin turns 20 years old and as such, we start to see a lot more grown-up fashion choices from him. A Saint Laurent sweater, a tailored jacket. SWOON. We see a continuation of the more mature fashion choices, and it seems that it’s even been taken up another notch. Continuing on, in 2016, Justin gave us an intense case of jacket envy. See for yourself. Casual and comfy is back in a big way and athleisure wear is clearly a fave look for him. The casual trend continues into 2018, with lots of comfy track pants, t-shirts and hoodies, and the occasional Hawaiian shirt. Long messy locks and facial hair top the look off. We’re digging it. Which Justin Bieber style era is your favourite? Let us know over on Twitter @umusic! Do You Know What “Despacito” Really Means?